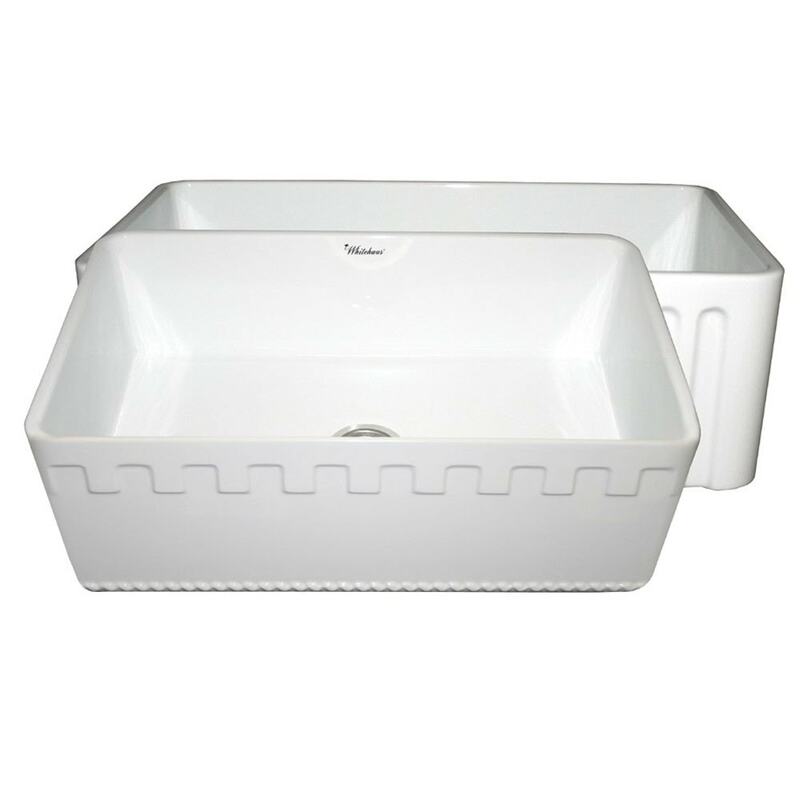 Whitehaus fireclay sinks are handmade from all-natural clay and lead-free materials. These sinks are incredibly durable and resistant to scratches, chips, stains and extreme temperatures, not to mention their simple maintenance. The WHFLATN3018 Farmhaus Fireclay Reversible Series sink comes in four finishes – white, biscuit, black and sapphire blue. It measures at 30” x 18”, making it the ideal size for all your kitchen needs. The sink has a Castlehaus design front apron on one side and a fluted front apron on the opposite, which gives you flexibility and transforms the look of your counters and will remain in style for years to come. US Patend No. D620092 S. Reverisble series fireclay sink with an athinahaus front apron on one side and a fluted front apron on the opposite side. Sink tapers slightly on sides. Due to the organic nature of the fireclay material dimensions may vary by 1/8" of an inch. We recommend having the sink on location to trace and measure for countertop and cabinet cut outs. This sink is made of fireclay which is the highest quality clay sink available exceeding that of porcelain due to higher baking temperatures and longer baking times. It is made from 100% white clay unlike cast iron sinks which are made from iron and simply coated with a layer of clay. It can withstand the hottest pots & pans with out a problem unlike fiberglass sinks. Bottom line these sinks are extremely durable and will stay with you for many years to come. This fireclay sink is compatible for use with a garbage disposal. The drain size is standard 3 1/2" and the sink is durable enough to use with a disposer, no problem. This sink has an extra thick bottom so it requires a drain with a longer screw than normal. We recommend the Whitehaus RNW35L (brass) or RNW50L (plastic) strainers and the WH202 waste disposer trim. Matching grid model WHREV3018 is also recommended. LIMITED lifetime manufacturer warranty to be free of manufacturing defects of both material and workmanship.10 year warranty against fading and staining of the glaze.